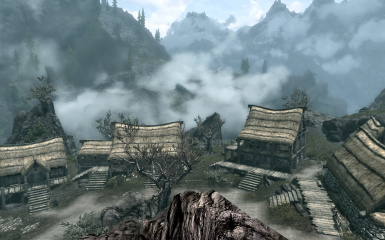 An all in one package for all of my villages released for Skyrim Legendary Edition. Hanaisse - Sign for The Horny Horker, road sign and shop sign assets, the Keld-Nar book, children's clothing textures, the unique Dwemer child assets for Nedri, and the blank inn sign resource used to create The Tapped Vein's sign. DanielCoffey - Better Book Mesh (https://www.nexusmods.com/skyrim/mods/37113) Used for the Keld-Nar book. Fixed a gap under a rock behind Borgny's house in Dawnstar. Fixed a bug with the investment option at the apothecary shop in Helarchen Creek. Forgot to generate and include proper facegen for all of the new NPCs. 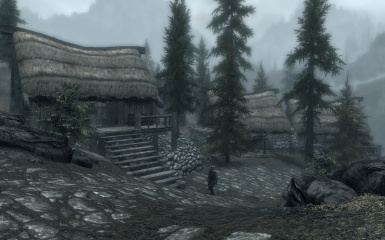 This package contains all 11 of the village mods I have released for Skyrim in one single package. It's been a popular request for some time and since I am no longer doing mods for Legendary Edition it seemed like as good a time as any to put this package together. The following villages are included: Darkwater Crossing, Dawnstar, Dragon Bridge, Helarchen Creek, Ivarstead, Karthwasten, Keld-Nar, Kynesgrove, Shor's Stone, Soljund's Sinkhole, and Whistling Mine. * Sondas Drenim will offer to share his house if married to you. * Derkeethus will offer to share his house if married to you, assuming you haven't recruited him into the Blades. 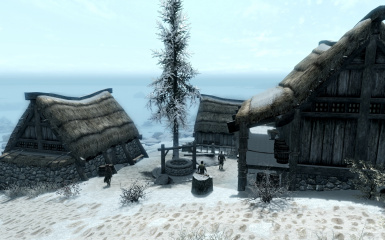 * Dawnstar NPCs all have their own homes and will no longer live their lives in the mines. * Two NPCs in Helarchen Creek can be married and will share their homes with you. * Temba Wide-Arm will offer to share her house if married to you. * Bonus: Golldir now has a home as well and will return to it once his quest, "Ancestral Worship", is completed. He can be married at that point and you can move in with him if you wish. 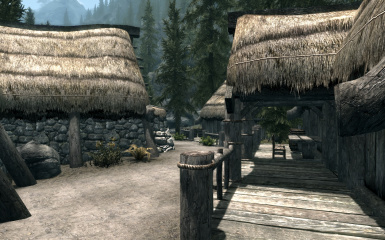 * Karthwasten NPCs all have their own homes now and will no longer crowd into a single barracks building. 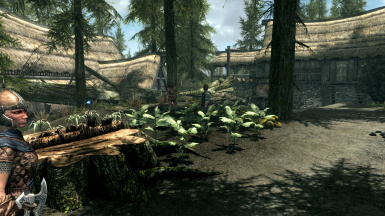 * Custom village of Kel-Nar in Eastmarch will all new NPCs, including a Dark Elf child. * Roggi Knot-Beard will share his house if married to you. * Dravynea will share her house if married to you. * Grelka will share her new house in Shor's Stone if married to you. She will also travel from the village back to Riften to run her shop during the week. 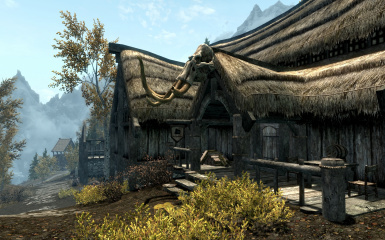 * Shor's Stone has a new custom inn which is an Easter Egg from Elder Scrolls Online, with full rent support and their own bard. 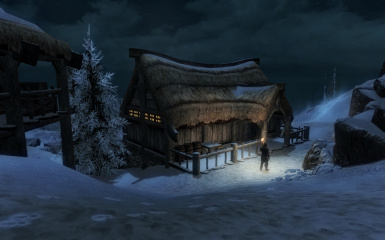 * Odfel's wrecked house now exists on the north side of Shor's Stone. So sad. * Perth can now share his house with you if you marry him. * New housing for the miners who live in Whistling Mine. No more sleeping and eating in a freezing cave. * All added shopkeepers have investment support. 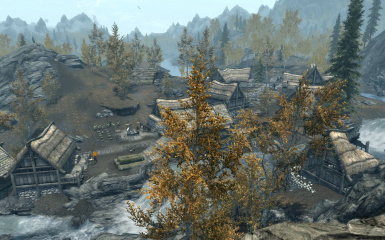 * LOD has been generated for every area, including trees that account for the changes. * Bug fixes and other updates that were applied to the SSE versions since December 2017 have also been added. Skyrim patch 1.9.32.0.8 or greater. Unofficial Skyrim Legendary Edition Patch version 3.0.14. No, this cannot be made an optional requirement. This package depends on certain things USLEEP does for the NPCs to work correctly. 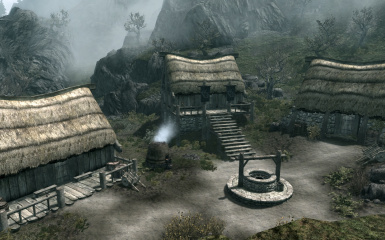 Drop the Arthmoor's Skyrim Villages - All In One.esp and Arthmoor's Skyrim Villages - All In One.bsa into your Data folder. Put simply, don't. This can't be done on an existing save. You will need to start a new game due to the way Skyrim works in order to change over to this all in one package. Otherwise you will likely end up with NPCs trapped in defunct cells unable to get out, and other script related things that happen during startup will get duplicated and possibly break something in the process. 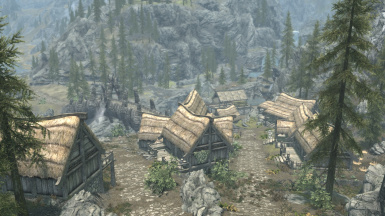 To remove the mod: Delete the Arthmoor's Skyrim Villages - All In One.esp and Arthmoor's Skyrim Villages - All In One.bsa from your Data folder. Then reload your game as usual. MUST load after Immersive Citizens AI Overhaul or the navmeshing will break. Fully compatible with Bring Out Your Dead. Fully compatible with Shezrie's Old Hroldan Town. 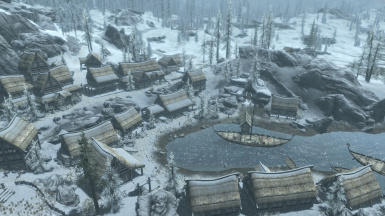 Mods altering Darkwater Crossing, Dawnstar, Dragon Bridge, Helarchen Creek, Ivarstead, Karthwasten, Keld-Nar, Kynesgrove, Shor's Stone, Soljund's Sinkhole, and Whistling Mine will not be compatible. Not compatible with "Hammet's Dungeon Packs for SE" due to location data conflicts with the Fahlmzund dungeon.